It is not uncommon for an association to have flooring restrictions to protect downstairs unit owners from excessive noise. Can a unit owner claim selective enforcement if an association only seeks to enforce the rules against the upstairs unit owners? What if the association’s president says it is “ok”? Maybe the flooring will still have to be ripped up! In a case hot off the presses, a Florida appellate court just concluded that an association did not selectively enforce or waive its flooring restriction. In Laguna Tropical v. Barnave, No. 3D16-1531 (Fla. 3rd DCA, January 25, 2017), a unit owner replaced her carpeting with laminate flooring. The following year, the resident below the owner’s second story unit complained about noise and asked the association to enforce the Declaration, which prohibited an owner from altering, modifying, or replacing the interior of a unit without the consent of the association, and to enforce a rule providing that only carpeting shall be installed in the units. Following an unsuccessful arbitration effort, the association filed suit against the owner to enforce the flooring restrictions. The trial court agreed with the owner’s defense of selective enforcement and granted judgment for the owner. The Florida appellate court reversed the judgment and returned the case to the trial court for enforcement of the Declaration against the owner. The court noted that of the condominium’s 94 units, 11 were only upstairs units, 11 were downstairs units, and the remaining 72 units included first and second floor space within the same unit. The configuration was important to the selective enforcement defense because owners of two story units who installed hard flooring upstairs would not have complained about their own flooring. Although the owner argued that the association only enforced the flooring restriction against 11 of the units, the appellate court noted that these 11 units were exclusively upstairs units. There was no evidence that occupants of the 72 upstairs-downstairs units ever complained to the association about the noise. There was only a “handful” of noise complaints by downstairs-only owners that led to successful enforcement by the association, which included either replacing the tile or wood flooring. Additionally, the court commented that there was no evidence that the association refused to enforce a noise complaint regarding a downstairs-only unit. “In the present case, the prohibition on floor coverings other than padded carpet is plainly intended to avoid noise complaints,” the court stated. The court concluded that no selective enforcement was proven since there were no complaints regarding any units except for units like the owner’s second-floor unit. In a second issue, the owner alleged that the association’s president e-mailed that it was ok to install the flooring. The court determined that the owner could not reasonably rely on the president’s e-mails. Why? Because the Declaration required alterations to be approved by the board of directors, no one officer could provide the approval. protect others and may not apply to general restrictions that impact the community at large, such as those rules regarding uniform appearance. Taking inconsistent positions or even making unclear statements after a claim was filed may curtail a Florida association’s defense in a lawsuit. The facts in Gil v. Tenet Healthsystem North Shore, Inc., 41 Fla. L. Weekly D 2567 (Fla. 4th DCA, November 2016) arose in a hospital but could just have easily occurred in a Florida community association. Mr. Gil’s wife then filed a wrongful death action against his employer, the hospital. The hospital maintained that no lawsuit could be filed because Mr. Gil’s wife’s exclusive remedy was through the workers’ compensation process. The lower court agreed and granted summary judgment for the hospital. The Florida appellate court disagreed, reversing the decision of the trial court. The appellate court explained that if an employer claims that an employee is not entitled to workers’ compensation benefits because “the injury did not occur in the course and scope of employment, or that there was no employment relationship,” the employer cannot claim immunity on the grounds that “the worker’s exclusive remedy was workers’ compensation.” The issue in this case was whether the hospital took inconsistent positions. The court pointed out that the language used by the hospital in its notice to Mr. Gil’s wife regarding the denial of benefits was ambiguous. Therefore, there was a factual issue of whether the hospital was prevented from claiming immunity from a lawsuit. It is time to gird for battle! Legislators and lobbyists have been flooding into Tallahassee. The state is in a state! 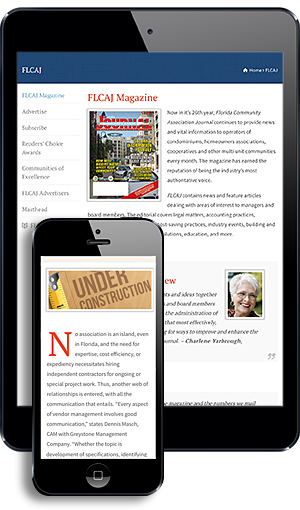 At this time of year, Florida community associations and their members warily watch for new legislative initiatives. It is too early to anticipate what, if any proposals that affect community associations will become law. Nevertheless, in advance of the March call to order for the Florida legislative session, legislative committees are scheduling and holding hearings. HB135. Seeks to change election procedure for communities containing 7,500 or more parcels. HB137 would require disputes concerning many homeowners association issues to be sent to the Division of Condominiums pre-suit binding arbitration program. HB295 seeks to extend the Division of Condominiums, Timeshares, and Mobile Homes’ jurisdiction to include homeowners associations for arbitration of administrative issues including records inspections and allowing the levy of damages for delays in production. SB318 seeks to revise the Marketable Record Title Act to except homeowners associations from the law extinguishing covenants. SB318, SB398, and HB433 seek to address the timing to provide, the effectiveness of, and charges for estoppel letters, including requiring letters being issued within ten days of the receipt of a request, and allowing requests by e-mail. HB377 and SB 204 seek to limit the statute of limitations, the time period in which claims can be brought, against architects and professional engineers. Seeks to clarify retention of official records, limiting the requirement to hold bids to one year, expanding election records to be obtained to include electronic records and for condominiums to clarify that records are to be provided within ten working days, rather than five. For condominiums extending the time for sprinkler retrofit opt-out and to reinforce that buildings under 75 feet or less are not required to take an opt-out vote. Bulk buyer exemptions are extended indefinitely. It is rumored that two bills are in drafting to clarify and improve the process for notifying contractors of construction information to reduce the potential of contractor liens. Keep “tuned in” for more information as it arrives. Senior Partner of Gelfand & Arpe, P.A. Michael J. Gelfand, Esq., the Senior Partner of Gelfand & Arpe, P.A., emphasizes a community association law practice, counseling associations and owners how to set legitimate goals and effectively achieve those goals. Gelfand is a Florida Bar Board-Certified Real Estate Lawyer, Certified Circuit and County Civil Court Mediator, Homeowners Association Mediator, an Arbitrator, and Parliamentarian. He is the Chair of the Real Property Division of the Florida Bar’s Real Property, Probate & Trust Law Section, and a Fellow of the American College of Real Estate Lawyers. Contact him at michael@flcaj.com or (561) 655-6224.